Trying to clear up the clutter of your life and become more efficient in your daily tasks? 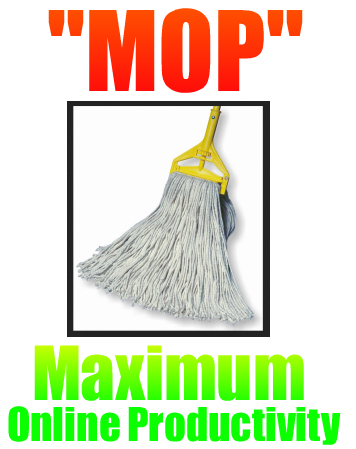 You can "MOP" up your daily routine with some of these valuable resources... all online, all free! Taken from my presentation to the Missouri State Capital chapter of the Society of Government Meeting Professionals, this is a collection of my most used online resources to make my work life run more efficiently. And hey, this might be a super silly/corny acronym, but I came up with this on the spur of the moment and it made me chuckle. So it stuck! Download the PDF by clicking on the link below or the picture, or right click and "save as" to a location on your hard drive. Then get to mopping. Do you have a favorite website that you use often? We would love to hear about it! Share it in the Disqus comments section below! I hadn't thought one single minute about Microsoft's newest operating system, Windows 8, until I did a little bit of reading recently. Apparently, this new release will run on older computers, up to about 4 years in age. Not only can you load Windows 8 on older computers, but it will also speed up your machine and make it run more efficiently. To ice the cake, the cost will only be $40 per license! This is a pretty radical change in pricing strategy for Microsoft. Plus it's a whole new paradigm in the evolution of their operating system. While everyone has started to write them off as the dinosaur headed for extinction, they come up with a new OS that is completely different in design and not a memory resource hog. That's really a basement level hardware requirement for running Windows 8. Computers as much as 4 or 5 years old could meet these hardware minimums. I know I have 2 or 3 computers just in my basement sitting and collecting dust that could run the new operating system. This is a huge plus for people with older systems still running on Windows XP. But from what I am hearing, you can even download and install the new Windows 8 on a machine that does not have a legitimate version of Windows running on it. This is a smart move on behalf of Microsoft. I imagine a significant amount of people will go legit and upgrade their computers due to the lowest price they have ever offered on a windows version since the days of Windows 3.1, plus considering how much of a jump this would be from an older version. You can also get a multi-touch capable tablet and run Windows 8. That's yet another major advantage. You would have the same operating system running on your tablet and your PC or laptop. I'm almost tempted to consider this instead of getting an Android tablet (which I already am not convinced would be a wise investment). Stay tuned for more reports as I get my first computer loaded with Windows 8! It will be exciting!